Use these sample Staffing Coordinator interview questions to evaluate candidates for your HR department. Feel free to add questions that match your job duties. Staffing Coordinators support the hiring process. They advertise job openings, liaise with college alumni organizations and conduct pre-employment candidate screening. During interviews, keep an eye out for candidates who understand the full cycle recruiting; from posting vacancies to onboarding new hires. Knowledge of labor legislation and experience with HR administrative tasks (e.g. organizing candidate data on internal systems) are important. Look for people with good communication skills, both oral and written. Consider adding a software test in your hiring process to evaluate candidates’ skills in creating spreadsheets and crafting emails. Also, since this position involves handling confidential information (e.g. personal details in resumes), ask how candidates managed and protected sensitive data in their previous jobs. What questions would you ask during a reference check? We are hiring for X role and an employee from that department asks you which candidates you have invited to an interview. How do you respond? What information would you include in a report about the quarterly hiring status? Suggest two or three ways you might attract potential hires at a job fair. 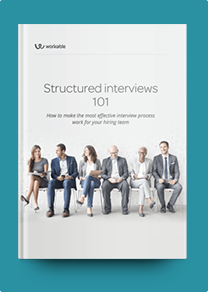 Describe an onboarding process you would implement for new hires. What software do you use to organize candidates’ resumes and application forms? What are your responsibilities once an employee gets hired? How do you perform background checks? What information are you looking for? How do you reduce bias from the screening process? Describe a situation where you identified a dealbreaker early on the hiring process. How do you stay up-to-date with labor legislation? Describe a time when you had to fill a position in a tight deadline. How did you speed up the process, making sure the quality of hire is still within standards? Some administrative tasks can be repetitive (e.g. updating internal databases.) How can we keep you motivated?